Quercus cerris, or more commonly known as the Turkey oak, is a large deciduous tree native to Southeast Europe and Southwest Asia. It has been naturalized in Britain and Ireland, where it had once been a native species before the ice age. Turkey oak has been naturalized in the states of Washington and Massachusetts and is also grown in some nurseries in the United States, but is not widely available. Easily identified by the furry acorn cup that it produces, this is a long-lived, easily maintained tree that is useful as a shade tree. Acorns from the Turkey oak are somewhat bitter but are eaten by some species of birds. Seed cups from this tree have been used as buttons, while the leaves, bark, and wood are used as a source of tannin. In some parts of Europe, the seeds are used to make coffee or ground into a powder for making bread or thickening soups. Cabinetmakers, turners, and wheelwrights sometimes use the wood of this oak; however, it is prone to cracking, which limits its use. For that reason, it typically is used for applications such as fencing and paneling. 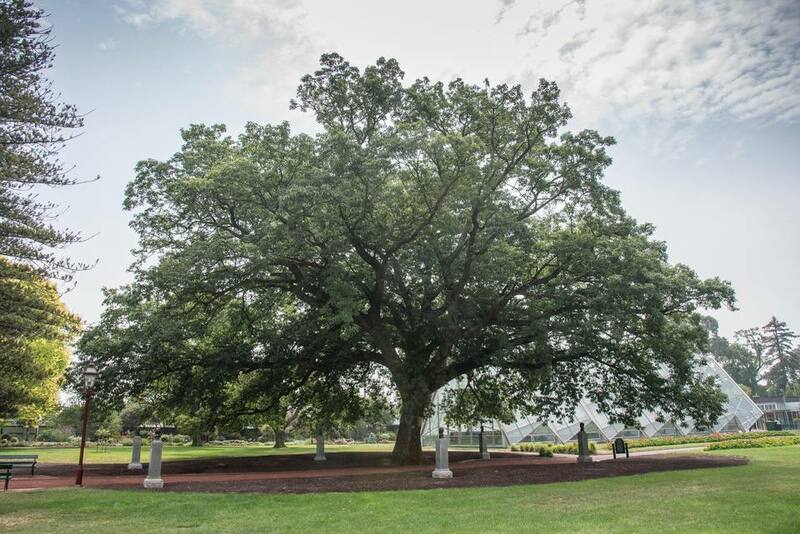 The botanical name for the Turkey oak is Quercus cerris, which is derived from the Latin word quercus which means "oak." Best known by the common name of Turkey oak or Turkish oak, this species is also known as the Austrian oak, bitter oak, European turkey oak, iron oak, manna oak, mossy-cupped oak, and wainscot oak. Turkey oaks can be grown in USDA zones five through nine, but are best suited for zones six and seven. A large and long-lived tree, over time this species can grow to more than 100 feet tall with an 80-foot spread. Typical specimens are 30 to 50 feet in height and width and have a symmetrical rounded crown. The trunk can grow to five feet or more in diameter. Turkey oaks prefer full sun but will tolerate partial shade conditions. They also tolerate high winds, making them suitable for windbreaks. Turkey oaks produce glossy leaves that are mid to dark green and grow two and a half to five inches in length. Each leaf is covered with fine stellate hairs and has six to twelve lobes on each side. These leaves hold their color well into the fall, eventually turning yellow-brown. It is not unusual for leaves to drop without changing color at all. The bark of the tree is rigid and gray, with deep fissures that are streaked with orange as the tree ages. The flowers are in the form of catkins that are pollinated by the wind, and take 18 months to mature. Much like all oaks, the fruit is a traditional acorn with the notable difference being a fringe of bristles that cover the acorn cup. Turkey oaks are used as an ornamental shade tree in parks, along roadsides, or as windbreaks in coastal regions. Although successful in a wide range of soil conditions, Turkey oaks prefer well-drained soils and do not tolerate wet soils on a long-term basis. Like many oaks, this species requires little maintenance. If used in public areas near walkways it may be necessary to prune lower branches for clearance. Turkey oaks are rarely subject to any diseases or pests but occasionally may fall victim to common maladies of the oak species, which include anthracnose, aphids, borers, cankers, caterpillars, leaf spots, oak lace bugs, oak leaf blister, oak wilt, and powdery mildew. One notable pest that this tree attracts is the gall wasp, the larvae of which damage the acorns of native British oaks. This proved to be a serious enough threat that in 1998 all Turkey oaks located on UK bases were ordered cut down by the Ministry of Defence.